Crescent Dunes Solar Energy, a 110 megawatt (MW) concentrating solar power (CSP) electricity plant, began full operation in February, according to its press release. Crescent Dunes uses an energy storage system that developers expect will be able to store enough thermal energy to generate electricity for up to 10 hours after sunset or on cloudy days when direct sunlight is unavailable. Through December 2015, CSP made up 8% of total U.S. solar electric generating capacity, while utility-scale solar photovoltaic (PV) made up 53%, and distributed solar PV made up 38%. Solar thermal electricity power plants differ from PV technology, which uses solar cells to convert direct and diffuse sunlight directly into electricity. Solar thermal plants rely on direct sunlight to focus the sun's heat energy onto collectors. Most of the earlier utility-scale CSP projects use parabolic trough technology, where curved mirrors focus sunlight onto receiver tubes of water or some intermediary fluid. 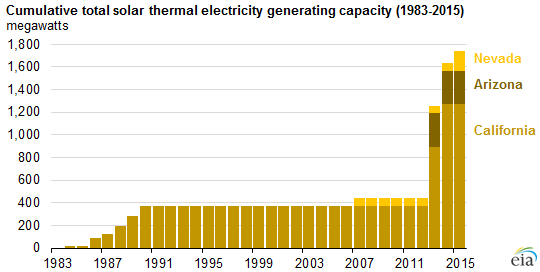 EIA data now show 1,777 MW of operating CSP capacity in three states: California, Arizona, and Nevada. Concentrated solar power technologies use mirrors that direct sunlight to heat an intermediary fluid, which then heats water into steam to drive a turbine. 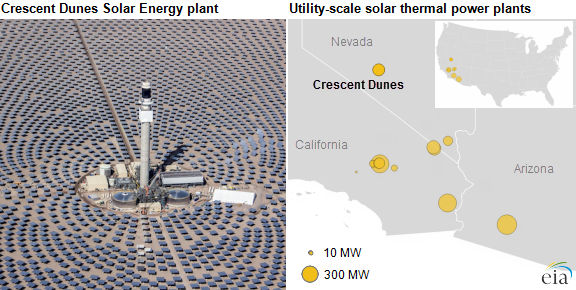 Crescent Dunes is the second CSP plant, after California's 400 MW Ivanpah plant, to use thousands of sun-tracking mirrors called heliostats to capture and focus sunlight onto a receiver in a tall central tower. Unlike most other CSP plants that use synthetic oil as the intermediary fluid, Crescent Dunes uses molten salt, which has more advantageous thermal properties. Liquid salt in a 640-foot central tower is heated by concentrated sunlight. When electricity is needed, the molten salt is pumped through a heat exchanger to turn water into steam that spins a turbine to generate electricity. Cooler salt flows back to a storage tank and the cycle repeats. Unlike the Ivanpah CSP plant, Crescent Dunes will not use natural gas as a secondary fuel. Crescent Dunes developers expect it to generate more than 500,000 megawatthours annually, equivalent to 1.3% of Nevada's 2015 utility scale net generation from all sources. Large renewable projects like Crescent Dunes rely on many forms of financing. Developer and owner SolarReserve LLC received a $737 million loan guarantee from the U.S. Department of Energy. Ivanpah, the earlier power tower project, received $1.6 billion. Crescent Dunes is also eligible for the 30% federal investment tax credit. Two more CSP projects could come online by the end of 2017, but neither has received regulatory approval or begun construction. Although individual CSP projects can be large, total installations of CSP systems have been small compared with PV systems, as 2,950 MW of utility-scale solar photovoltaic plants began operating in 2015 alone. Given its significant cost advantage, PV technology is expected to provide nearly all further growth in U.S. solar power in the foreseeable future.